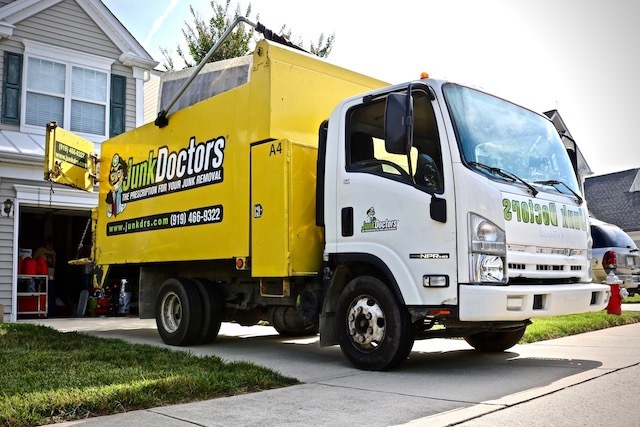 When we started Junk Doctors, we had very little money and no credit history to take out a loan. We had to pay cash for whatever we did. That meant we had to start using an old pickup truck and trailer. Once we saved up enough money, we purchased a used 2004 Got Junk Isuzu NPR HD. We paid $11,500 for that truck and it had about 100,000 miles on it. The truck came from Florida, so was rust free. It was a great buy! Probably the best buy on a used truck we’ve ever had. Since then, we have bought 8 other dump trucks. Six of them were used and two of them were new and outfitted with our own custom body. Five of them were Got Junk trucks and one was an old College Hunks vehicle. The Got Junk truck body can be easily identified by its weight-reducing, “corrugated” sides. The Got Junk truck body is an excellent body for those NPR trucks. It’s lightweight, which allows for a greater payload capacity than other brands. An empty Got Junk NPR weighs under 10,000 pounds, whereas a College Hunks truck will weigh significantly more. That means that with a Got Junk truck, you can add a payload of up to 2500 pounds before you’re overweight. That isn’t a ton (no pun intended). With its heavy body, the College Hunks truck can carry even less weight. On the other hand, Junk King went with NRR trucks (just like we do now on our new trucks). That gives you a 19,500 Gross Vehicle Weight Rating (GVWR), so you have a high useful load capacity with the NRR. However, with its availability, affordability, and capability, the Got Junk truck is a great truck to start with on a budget. The College Hunks truck body has smooth sides and larger toolboxes, but at the cost of increased weight and decreased payload capacity. There are a few resources you can use to find great Got Junk trucks. The first two are commercialtrucktrader.com and truckpaper.com. Select “Used Truck,” “Isuzu,” and “Dump Truck.” Then just scroll through and look for pictures of a dump truck with a Got Junk body. 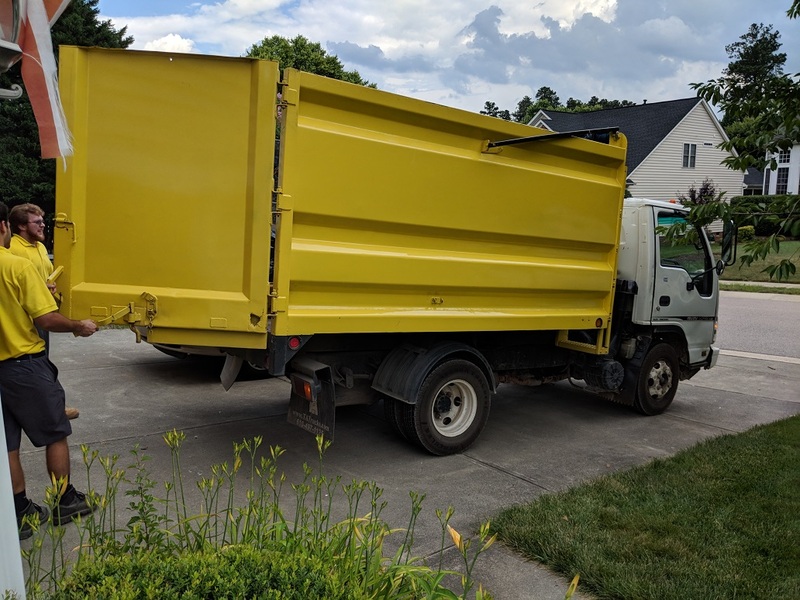 One great resource that often tends to have Got Junk trucks available is TA Trucks in Chester Township, Pennsylvania. Some of them are high mileage, so keep an eye on them. You can browse their inventory at http://tatrucks.com/. A good used Got Junk truck with 100,000-170,000 miles will generally cost around $25,000 depending on the year. A later model truck will be a bit more expensive, and a pre-2005 truck a bit less. I would be hesitant to purchase a truck with more than 170,000 miles on it, as the transmission in these trucks tends to go out around 240,000 miles. The engines, with regular maintenance, are good for over 300,000 miles. Transmissions cost around $6,000 to replace, and engines will be a bit more. If you’re buying a truck with very high mileage, this is definitely something to consider. Always look for rust on these trucks. Some rust on the frame isn’t a big deal, but pay close attention to the fuel and brake fittings and inspect the hose clamps. If there is rust on these components, it still might not be a deal breaker. But think long and hard because any repairs that do have to be made will likely be much more expensive. If something breaks on a rusty truck and the repair requires the removal of other parts, there is a good chance that other parts will break due to rust. They will have to be replaced, increasing repair time and cost. Be careful! Got Junk trucks are a great way to get started. They feature the tool box, ladders, high sides, and dual barn doors that are needed for junk removal. There are thousands and thousands of these trucks on the road, and used ones can generally be found with just a bit of looking. Get out there, get your truck, and get started today!